Figure 7-6. Changes in propeller blade angle from hub to tip. The reason for the twist is to produce uniform lift from the hub to the tip. As the blade rotates, there is a difference in the actual speed of the various portions of the blade. The tip of the blade travels faster than the part near the hub, because the tip travels a greater distance than the hub in the same length of time. [Figure 7-7] Changing the angle of incidence (pitch) from the hub to the tip to correspond with the speed produces uniform lift throughout the length of the blade. A propeller blade designed with the same angle of incidence throughout its entire length would be inefficient because as airspeed increases in flight, the portion near the hub would have a negative AOA while the blade tip would be stalled. Small aircraft are equipped with either one of two types of propellers: fixed-pitch or adjustable-pitch. Figure 7-7. Relationship of travel distance and speed of various portions of propeller blade.Figure 7-7. 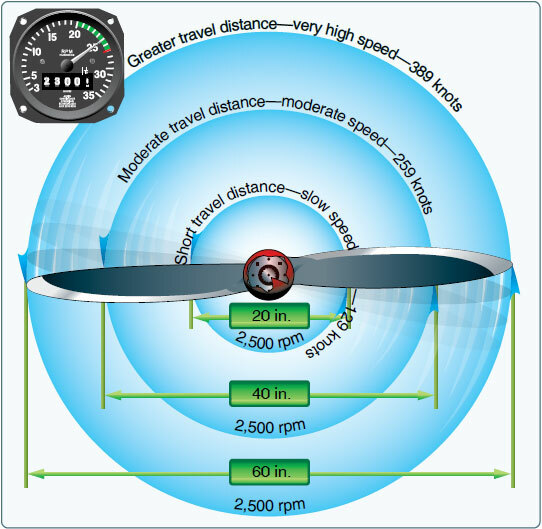 Relationship of travel distance and speed of various portions of propeller blade. A propeller with fixed blade angles is a fixed-pitch propeller. The pitch of this propeller is set by the manufacturer and cannot be changed. Since a fixed-pitch propeller achieves the best efficiency only at a given combination of airspeed and rpm, the pitch setting is ideal for neither cruise nor climb. Thus, the aircraft suffers a bit in each performance category. The fixed-pitch propeller is used when low weight, simplicity, and low cost are needed. There are two types of fixed-pitch propellers: climb and cruise. Whether the airplane has a climb or cruise propeller installed depends upon its intended use. The climb propeller has a lower pitch, therefore less drag. Less drag results in higher rpm and more horsepower capability, which increases performance during takeoffs and climbs but decreases performance during cruising flight. The cruise propeller has a higher pitch, therefore more drag. More drag results in lower rpm and less horsepower capability, which decreases performance during takeoffs and climbs but increases efficiency during cruising flight. The propeller is usually mounted on a shaft, which may be an extension of the engine crankshaft. In this case, the rpm of the propeller would be the same as the crankshaft rpm. On some engines, the propeller is mounted on a shaft geared to the engine crankshaft. In this type, the rpm of the propeller is different than that of the engine. In a fixed-pitch propeller, the tachometer is the indicator of engine power. 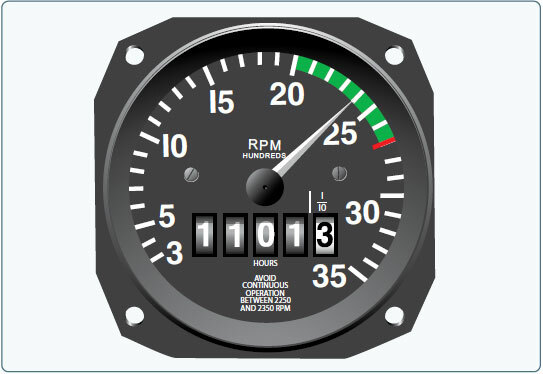 [Figure 7-8] A tachometer is calibrated in hundreds of rpm and gives a direct indication of the engine and propeller rpm. The instrument is color coded with a green arc denoting the maximum continuous operating rpm. Some tachometers have additional markings to reflect engine and/or propeller limitations. The manufacturer’s recommendations should be used as a reference to clarify any misunderstanding of tachometer markings. Figure 7-8. Engine rpm is indicated on the tachometer. The rpm is regulated by the throttle, which controls the fuelair flow to the engine. At a given altitude, the higher the tachometer reading, the higher the power output of the engine. When operating altitude increases, the tachometer may not show correct power output of the engine. For example, 2,300 rpm at 5,000 feet produces less horsepower than 2,300 rpm at sea level because power output depends on air density. Air density decreases as altitude increases and a decrease in air density (higher density altitude) decreases the power output of the engine. As altitude changes, the position of the throttle must be changed to maintain the same rpm. As altitude is increased, the throttle must be opened further to indicate the same rpm as at a lower altitude.